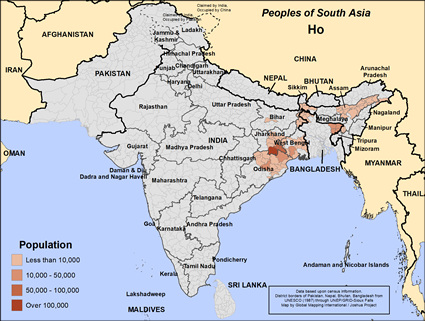 The Ho of India, unlike most other peoples in India, are classified as Caucasian. Most live in the forest area of the Chota Nagpur Plateau in the Southern Bihar region of India. Groups also inhabit Northern Orissa as well as parts of West Bengal, Bangladesh, and Nepal, all areas clustered near the northeastern corner of India. Because they speak Ho (the Lahore dialect of the Maunder language), they are grouped with other Maunder-speaking groups such as the Saints and Mounds of India. The word "ho" means man. According to Ho belief, all other groups of people are considered to be foreigners or outsiders, and not men. This may explain their independent and sometimes isolationist nature. A number of outsiders, such as the British and Muslims, have ruled the Ho tribe, but their fiercely independent nature has successfully kept them from the rule of the predominant Hindu. 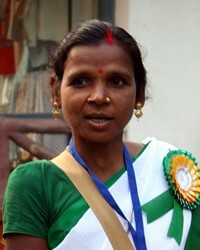 The Ho consider themselves to be a separate tribe and not part of the Hindu caste system, even though around one-third follow the Hindu belief system. Unlike the majority Hindus who make up India, the Ho eat meat and drink rice beer. The tribe's culture is intertwined with the natural world. They are most comfortable in the forest environment that supplies many of the necessities they need for living. Roots, leaves and flowers of plants, grass, fruits, nuts, berries, mushrooms, and silk moth cocoons are used for food, trade, or medicine. Their major agricultural crop is rice, which they ferment to make beer. Mining for minerals found under the soil is the base for newly developing industries in nearby cities. Villages are led by headmen who settle disputes and control the rent toll. Houses are usually made of mud and leaves of palm or other trees. Feasts or festivals mark the end of one season or the beginning of another. The major feast, called the "feast of contracts," is held after the annual harvest. The festival lasts about two months and includes singing, dancing, and drinking. All obligations and contracts end until the new year. Many marriages also take place during the festival. Traditionally, a Ho marriage takes place when the groom's family pays a chari (bride price). In the past few years, however, a dowry (gifts or money from the bride's family to the groom) has begun to take the place of a chari. The majority of the Ho are animists (believing that non-human objects have spirits) who worship clan gods such as a snake or monkey, and spirits which are approached through witchcraft or trances. They believe the world is full of bongas (spirits) that exist in objects of nature. Meat and beer are offered as a sacrifice to the bongas because they can cause disease and bad luck to those who do not appease them. Once a man worships a bonga, it becomes his teacher and the man becomes a shaman (medicine man or priest). The village protector spirit is asked by a priest to watch over the Ho activities and to protect them from evil spirits. The Ho believe a man's shadow is his individuality, his character, which grows and develops throughout his life. The shadow never dies, but when a man dies, his shadow returns to his house where it is joined by other 'house dead' who dwell with his family. The 'house dead' either help or trouble the family depending on the amount of respect given to them. The New Testament is printed in the Ho language and some missions agencies currently labor among these people. Although efforts are being made to evangelize the Ho, their response has been very low-only a small number are Christians, so there is a strong need for further prayer and evangelism. * Pray that the truth of the Gospel will set them free. * Pray that the Ho who have heard the Gospel of the One True God will accept Him and work to reach their own people for Christ. * Ask the Lord to soften the hearts of the Ho so they will want to know Christ. * Ask God to grant wisdom and favor to missionaries trying to reach the Ho for Christ. * Pray that God will protect and encourage the small number of Ho Christians.View Ho in all countries.